Well, Wurstfest is over. 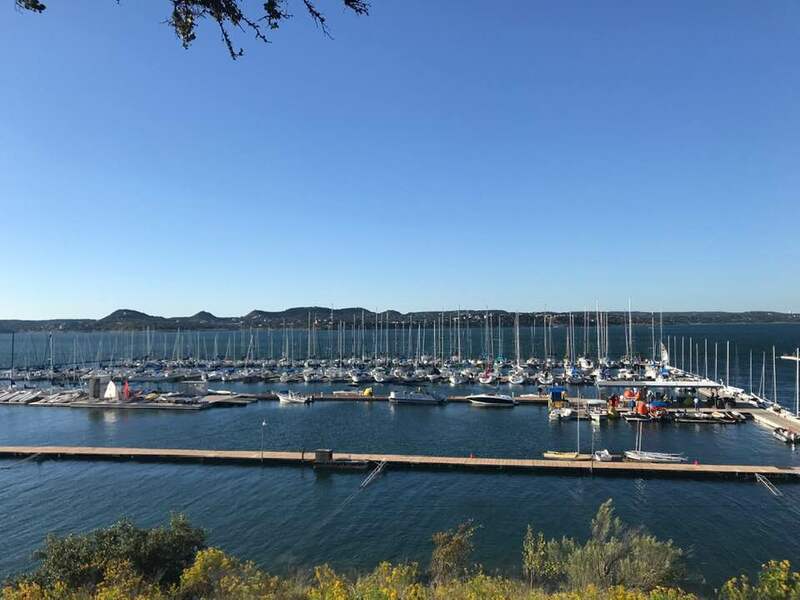 Lake Canyon YC hosted the 50th Annual Wurstfest Regatta this past weekend and Canyon Lake let us know who the real boss is. 15 RS Aero's signed up for a 50th annual blast, and I mean blast! Saturday saw winds of 18 knots gusting to 35+. A 'refreshing' change from the run of light air regattas we've been having. Hank Saurage saw 14.7 knots on his speed puck, but I know we were hitting 15+ on the reach back home, although I couldn't see anything with all the spray coming off the boat. Excellent Ride!!! We had several newbies to the fleet including Collegiate sailor Zack Marks, who was able to hike a little bit (lol) harder than us, lets say, slightly older sailors, and it showed with a clean sweep of the regatta. Long Ta from Viridian showed extreme improvement in his Aero skills with a strong 5th place showing. Fred Schroth showed he is going to be a fleet contender as he pushed me the entire weekend (not that thats a difficult task or anything, just saying). We will kick off the season with the inaugural RS Aero Gulf Coast Championships at Sea Star Base Galveston in March (stay tuned for actual dates). The idea here is to have a regatta we can move up and down the Gulf Coast to hopefully generate class interest through Mississippi, Alabama and the Florida panhandle. After that we will have regattas in Austin and at the Viridian Sailing Center, Dallas, in April and May. Mark at KO Sailing is still trying to workout which will be which. Dates will be announced ASAP. Our plan is to have 7 or 8 events spread throughout Texas, taking each sailor's best 5 regatta finishes and to award a Circuit Champion at Wurstfest at the end of each year. Great 2018 RS Aero sailors. The fleet is really starting to grow. Lets all plan on an outstanding 2019! Keep in touch via the North American Facebook Group.